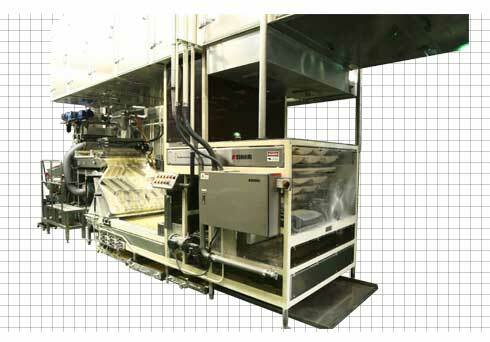 Products Line ['MUFFIN' Line] | OSHIKIRI MACHINERY LTD. 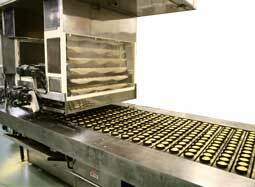 The mass production system of English muffin equipment consists of 4 machines ; Divider, Rounder, Proofer and Griddle. The capacity is 500 - 1500 dozen/hour. 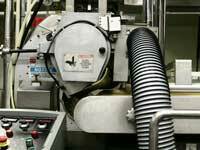 Each piece of high speed equipment is operated synchronously to assure precise transfer of product. Divides dough in a set volume. Rounds dough in a perfect ball shape. Dough, sprinkled with grits, fed to proofer. Griddle Dough turned inside out and baked brown.